A new interactive visualization on the ETE Dashboard presents the most comprehensive set of Pre-Exposure Prophylaxis (PrEP) use data in New York State to date, showing 24,400 individuals filling a PrEP prescription between January – June 2018, a 16% increase from the prior 6 months (July – December 2017). Building off of our previously released data on PrEP use among individuals covered by Medicaid, this new visualization more closely represents all PrEP prescriptions filled in New York, including both Medicaid and non-Medicaid covered individuals from the data source Source Healthcare Analytics (Symphony). [i] The latest Dashboard data show that 5,857 of these individuals were Medicaid clients and 18,543 were non-Medicaid clients during the first half of 2018. 10,068 (41%) were White/Caucasian, 3,335 (14%) Black/African-American, and 2,000 (8%) Hispanic. Note: A large proportion of individuals in this data set (8,997 [37%]) were characterized as Other/Missing/Unknown race. Meanwhile, in 2017, 79% of new HIV diagnoses were among males, 83% among persons of color, and 39% under the age of 30. Using these data to monitor trends in PrEP use and focus our attention on the persistent disparities in access to biomedical HIV prevention may be crucial to address key challenges in meeting our targets for ending the epidemic. As evidenced from the data, there is disproportionately higher PrEP use among Whites, for example, when considering their substantially lower new HIV diagnosis numbers and rates as compared to Blacks or Latino/Hispanics. These data represent a call to action to prevent further exacerbating existing racial/ethnic disparities in HIV incidence, and have the potential to inform program planning around the ongoing scale-up efforts to improve equitable access to PrEP across New York State. 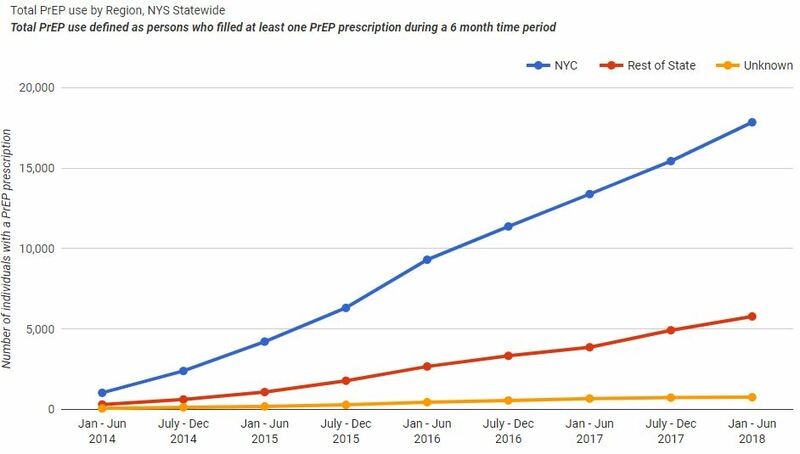 This new more comprehensive visualization of PrEP use in New York presents a much larger picture of PrEP use across the state, which was previously restricted to clients of Medicaid. We still provide an option for viewing Medicaid-only, a key population for all HIV prevention related efforts. As evidenced on the Dashboard homepage, the NYS DOH AIDS Institute has a Medicaid-specific ETE target to increase PrEP use among Medicaid recipients to 30,000 by the end of 2020. The interactivity of the visualization allows users to stratify the data by demographics or geographic region (Ryan White Region or NYC borough level). It further breaks down the data by statewide, rest of state (NYS excluding NYC), and NYC, so the user can view demographic trends within NYC separately from the rest of the state. EXPLORE ALL OF THE DATA HERE! [i] Source Healthcare Analytics (Symphony) was used to extract prescription data for all payors with the exception of Medicaid. The Medicaid data is pulled separately from the NYS Medicaid Data Warehouse (MDW). While Source Healthcare Analytics (Symphony) data contains over 90% of the prescriptions dispensed nationally, this does not mean that the completeness of the PrEP prescriptions filled is necessarily at 90%. This is due to a lower level of completeness of medical claim information in Symphony, which the NYS PrEP algorithm relies on for excluding prescriptions for individuals with other conditions (HIV, HBV).